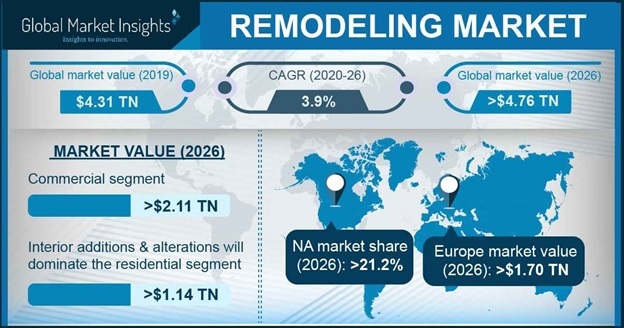 Remodeling Market size is estimated to surpass USD 5 trillion by 2024; according to a new research report by Global Market Insights, Inc. Technological advancements, increasing disposable income, along with a need to live in a better environment will stimulate the remodeling industry growth in the residential sector. Need to increase employee productivity coupled with reducing fixed expenses including electricity bills will primarily drive the business demand from commercial sector. Advantages of improving the home ambience along with improved storage is strongly supporting the market growth. Increasing design innovations with use of eco-friendly materials will boost the demand for remodeling industry. Increasing land prices resulting in exponentially higher cost of houses, has impacted the demand for new construction thereby influencing to buy old homes at lower price and then transforming the style and structure of a place. Countries observing high climatic variations display high remodeling potential owing to roof damage and door size changes. Regions witnessing high intensity of disasters such as cyclones and earthquakes are expected to display considerable demand for disaster repair remodeling application. Increasing count of regional and global companies proving remodeling services within a stipulated budget and time period is expected to fuel the market growth. Lower interest rates directly result in increased household expenditures. Increasing consumer spending on home owing increasing socializing particularly house gatherings will expand the market revenue. Commercial remodeling is expected to account for over USD 2.2 trillion in 2024 and is expected to growth at a substantial rate during the forecast period. Benefits of remodeling the office including energy efficiency, improved employee performance, employee satisfaction will support the commercial segment demand. Additionally, advantage of corporate social marketing by transforming the space into an eco-friendly office will augment the business development. Growing tourism industry along with need for improved ambience will primarily drive the commercial remodeling market through hotels and restaurants. Higher construction costs have led to increasing count of rented offices displaying strong market potential. North America accounted for a significant share of the global remodeling market in 2017. The region has largest consumer spending and is among the largest economies. Lifestyle changes, high socializing, technological advancements, and design innovations are among the key factors positively influencing the market development. Areas witnessing high snowfall display a significant spending on snow removal services. Regions witnessing disasters at a regular interval require high remodeling services. Trend towards building an environment friendly office owing to increasing environment related government policies will fuel the service demand in the region. According to industry sources, majority of the spending on home is done by the senior age group in North America while moving towards their retirement. Major industry players in the global remodeling market share include Andersen Corporation, ABC Supply, Builders First Source, Dow Building Solutions, Hanley Wood LLC, GAF Materials Corporation, Ferguson Enterprises, Fortune Brands Home & Security, and the Home Depot. Other prominent players in the industry are Kohler Co., Lutron Electronics, JELD-WEN, National Gypsum Company, Masco Corporation, Oldcastle Building Products, Owens Corning, Move Inc., Pella Corporation, Ply Gem Industries Inc., ProBuild Inc., The Sherwin-Williams Company, and USG Corporation. Mergers & acquisitions are among the key strategies adopted by the service providers to expand their product portfolio and gain market share. For instance, Fortune Brands Home and Security acquired Norcraft companies to expand the product offerings for kitchen and bathroom.